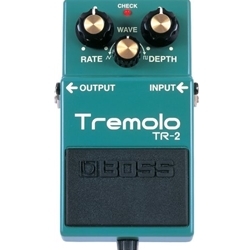 Before Boss figured out how to churn out reliable pedals that could digitally conjure up sounds like the TR-2, before any outboard effects existed at all, there was tremolo. In the golden age of amplifiers, all the effects were built-in, and the pickings were slim, usually only reverb and tremolo. As a result, many artists were eager to use these novel effects, especially tremolo, forever associating that wavering sound the early days of electric guitar. Amp manufacturers have strayed away from onboard tremolo (with the exception of some reissues), but the Boss TR-2 can take you back to that era with the tap of your foot.